Princess Lily, the eldest of twelve sisters and heir to a mighty kingdom, desperately seeks a break from her mother's matchmaking. Tradition forbids marriage with the man Lily loves, so she would rather rule alone than marry someone who only wants the crown. Fleeing an overzealous suitor, Lily stumbles into a secret underground kingdom where she and her sisters encounter a mysterious sorcerer-prince and become entangled in a curse that threatens the safety of her family and her people. Lily can free them, but the price for freedom may be more than she's willing to pay. 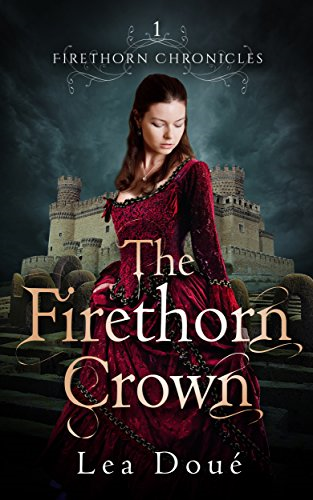 Note: The Firethorn Crown was the February Read for the Fellowship of Fantasy Indie Book Club. If you'd like to join the club for future reads, you can join here on Facebook or sign up for their mailing list here. The only book by George I ever started was Tuesdays at the Castle, but I only got a few chapters in. For whatever reason, it just didn't capture my interest. Some cool premises, just nothing I felt I had to keep reading. It's kind of a "road block" to me picking up anything else by here, though, while it is still on my shelf unfinished. Not that my "to read" pile is anything but impossible at this point. I tend to be a really picky reader now. If it doesn't have me enraptured in a couple chapters, I usually stop and look for something else.